Boers-Li Gallery is delighted to present “Jiang Zhuyun: Perhaps the End Precedes the Beginning” on July 19, 2018. This show marks the artist’s first presentation at the gallery. 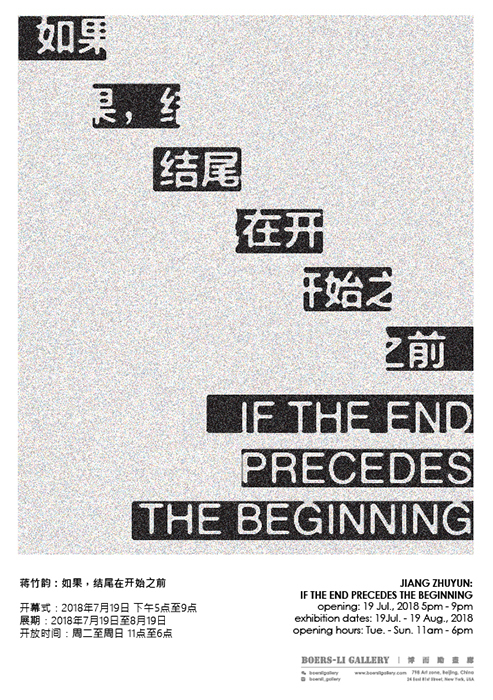 “Perhaps the End Precedes the Beginning” draws from the phrase in T.S. Elliot’s Four Quartets, “… or say that the end precedes the beginning, and the end and the beginning were always there, before the beginning and after the end. ” Taking personal experience and memories as a point of departure, Jiang Zhuyun takes the retinal movements of his reading as a visual copy of the original text, to project his personal interpretations on order and pause, hindrance and feedback. 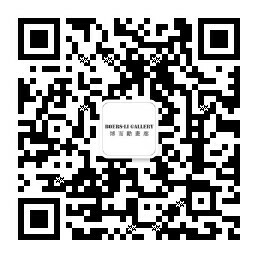 Jiang Zhuyun’s works span a wide range of artistic mediums. He is currently a lecturer at the School of Intermedia Art at the China Academy of Art. In 2017, he was shortlisted for the Huayu Youth Award. Jiang Zhuyun (b. 1984), has been the subject of solo exhibitions including, “Survival in System”, West Bund Art Fair, Shanghai (2017); “I Talk to The Wind”, Hunsand Space, Beijing (2016); “Letters”, Earport, Duisburg (2015); “AT LAB: Pass Word Project”, Hunsand Space, Beijing (2015). Jiang Zhuyun’s works and projects have been included in group exhibitions including, “Stop Making Sense”, Hunsand Space, Beijing (2018); “Presence”, China Academy of Art, Hangzhou (2018); “Art Patron”, Qiao Space, Shanghai (2018); “Concepts of Visual Poetry” Palais Bellevue #2, Kassel (2018); “Bad New Days Ahead”, Taikang Space, Beijing (2017); “Simultaneous Eidos”, Guangzhou Image Triennial, Guangzhou (2017); “Shared Vision”, Art Sanya, Sanya (2017); “Bunker Dialogue”, The Bunker, Beijing (2017); “Moments and More”, OCAT, Shanghai (2017); “MIC/MAC”, A2Z, Paris (2016); “No. 0 Be Yourself Festival”, JNBY HQ, Hangzhou (2015); “Sound is True”, UC Berkeley, Berkeley, USA (2008); “Pierre Huber Creation Prize Nominees Exhibition”, Bizart, Shanghai (2007) and etc.